A heavy turnout was witnessed in Ratia Assembly segment, where over 81 per cent voters exercised their franchise for electing their representative in the bypoll held today. Polling for the byelection to the Adampur Assembly segment passed off peacefully with 75.79 per cent of voters exercising their franchise. No untoward incident was reported from anywhere in the constituency. Will Congress break 29-yr jinx in Ratia? The dream of over 12,000 families, belonging to the below poverty line (BPL), of having a house of their own will soon turn into reality. As part of its social commitment, the Housing Board Haryana (HBH) is set to complete these dwelling units on the land transferred by the private colonisers. The Haryana Government has issued transfer orders to five IAS officers with immediate effect. Believe it or not, the 37-year-old Haryana Tourism Corporation (HTC) has no service rules for its employees till date. A day after irate residents of Nissing, pressing for registration of a case of murder against the accused, Buta Singh and his family members, blocked the Karnal-Kaithal road for several hours, members of the Sikh community today came out openly in support of Buta Singh and resorted to blockade of the same road at Gurdwara Chowk, demanding cancellation of the case against the accused persons. The police has arrested one of the accused allegedly involved in the murder of Dalbir Thekedar, sarpanch of Naya Baans village, here on Sunday. Six persons had been booked by the police in this case. Sarfi Bai of the INLD, Jarnail Singh of the Congress, Mahavir Parshad of the BJP-HJC alliance and Ram Kumar Bahbalpuria of the CPM are among 16 candidates, whose fates were sealed in the EVMs today. The polling began at a brisk note, particularly in rural areas, where people started queuing up in front of the polling booths since morning. As farmers are relatively free during this part of the year, the villagers turned out in large numbers and a heavy rush was witnessed inside the polling booths as well as near the counters set up by the agents of various candidates. In the first three hours, over 27 per cent voters had cast their votes. The polling was 42 per cent at 12 noon, 52 per cent by 1 pm, 58 per cent by 2 pm, 63 per cent by 3 pm and the figure had crossed 70 per cent by 4 pm. In a polling booth in Haroli village, nearly 80 per cent voters, 695 out of total 873 to be precise, had polled their votes by 2.30 pm. In Shehnal, a large number of women were seen waiting in a lawn of the school, as the polling officials were taking their lunch. In Ratia town, polling continued for over an hour after 5 pm in some polling booths as a number of voters had queued up. The ruling party’s agent in Ratia town, Bhupesh Mehta, block president of the Sirsa Congress, said people had turned up in large numbers in almost all polling booths of the town. The polling was largely peaceful except a few minor incidents. In Sarfi Bai’s Sardarewala village, the three polling officials sent by the authorities to conduct polling were found missing last night. On a complaint by the MP, Ashok Tanwar, it was found that the local agents of a political party had taken them away for drinks and dinner. The police later arrested the three officials, Ram Gopal, Dara Singh and Malkiat Singh, under Sections 129 and 134-A of the People’s Representation Act 1951 and produced them before a magistrate today, where they were released on bail. The authorities sent a new team of polling staff with fresh polling material to Sardarewala late in the night. Usha Dahiya, district president of the Mahila Congress, alleged that the police at Bahmanwala barrier stopped Neeru Jain, president of the Ratia city unit of the organisation, who was coming from Zirakpur to cast her vote. Tanwar for the Congress and Ashok Arora for the INLD were seen seeking reports from their workers in various villages of the constituency, while the BJP nominee Mahavir Parshad was himself getting feedback from his agents. Both Tanwar and Arora claimed their candidate would win the election, after the polling was over. Polling began on a brisk note and 9 per cent of voters cast their votes in the first hour. 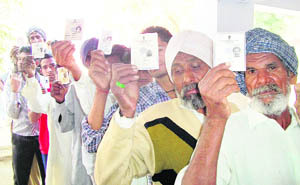 By noon 35 per cent voters had cast their votes. There was a slight lull in polling thereafter for an hour during which only 6 per cent voters cast their votes between 12 noon and 1 pm. However, it gained momentum in the next one hour which recorded 11 per cent turn out. The next hour saw only 5 per cent voter turnout and by 3 pm 57 per cent voters had cast their votes. The maximum turnout of voters was between 3 pm to 4 pm during which 13 per cent voters cast their votes. Long queues were seen at most of the booths with women turning out in equal numbers. 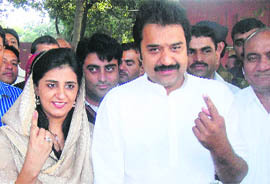 The HJC-BJP nominee, Renuka Bishnoi, cast her vote at the Market Committee polling booth along with her husband Kuldeep Bishnoi, MP, and her mother-in-law. She said she was confident of winning the byelection by a huge margin. She thanked the voters for their support. The Congress nominee, Kulbir Beniwal, and the INLD candidate, Ram Singh Baswana, were also among those who cast their votes in the early hours. Adampur has a total of 137949 voters including 63169 women. As many as 159 booths had been set up for polling which were manned by 840 officials. The administration had deployed 39 Duty Magistrates and 60 Micro Observers. A total of 207 EVMs were deployed including the machines kept in reserve quota. About 3,700 security personnel had been deployed which included 579 jawans of the CRPF. The polling booths in 15 villages had been dubbed as sensitive while 55 booths in 10 villages had been categorised as very sensitive. Adampur has been the bastion of the Bhajan Lal family for 43 years. The triple-storeyed two-room flats with kitchenette and toilet covering an area of about 300 square feet has been priced at Rs 3.64 lakh each and the monthly instalment would not exceed Rs 1,500, sources told The Tribune here today. MK Mahajan, Chief Administrator of the HBH, asserted that the HBH was committed to providing quality housing at reasonable rates to the poorer sections of society. With a view to provide houses to the poor and check mushrooming of slums in the urban areas, the state government had made it mandatory for the private developers to reserve 20 per cent of the residential plots for allotment to the economically weaker section (EWS) in the layout plan approved by the Department of Town and Country Planning (DTCP). Under the policy, 50 per cent of the plots reserved for the EWS in the residential colonies, developed by the private colonisers, were to be transferred to the HBH for low-cost housing at the rate of Rs 500 per square yard. Subsequently, the DTCP had offered 3,400 plots of 60 yards each to the housing board from 36 colonisers at the cost of Rs 12 crore. Work on the residential units in Gurgaon, Rewari, Dharuhera, Faridabad, Sonepat, Fatehabad, Sirsa, Yamunanagar, Kurukshetra, Panipat, Karnal, Narwana and Rohtak is in progress and the beneficiaries will get the flats soon. Over 11,781 BPL families have already been registered under the scheme so far. Over 4,000 poor persons will be allotted plots measuring 60 square yards by colonisers at the rate of Rs 500 square yard. The flats constructed in the multi-storeyed complexes would be allotted at maximum rate of Rs 50,000 per flat by the colonisers to persons registered under the BPL category. Ajit M Sharan, Financial Commissioner and Principal Secretary (FCPS), Finance, Planning and Technical Education, has been given the additional charge of FCPS, Power, against a vacant post. Tarun Bajaj, Commissioner, Rohtak division, goes as the MD, Haryana Power Generation Corporation, vice Sanjeev Kaushal, who has proceeded on leave. Arun Kumar Gupta, awaiting posting orders, becomes Director-General and Special Secretary, Food and Supplies Department, and vice Balraj Singh, MD, CONFED, who retired today. DPS Nagal, Chief Administrator, HUDA, Panchkula, has been given the additional charge of Director-General and Special Secretary, Urban Local Bodies and Project Director, Swaran Jyanti Shehri Rozgar Yojna and State Urban Development Society, relieving TC Gupta. TK Sharma, Commissioner, Gurgaon division gets additional charge of Rohtak division vice Tarun Bajaj. The HTC authorities have assured its employees of framing the set of rules and implement these accordingly at their meeting with the Haryana Tourism Corporation Employees Union yesterday. The union has, meanwhile, announced to hold a meeting on December 5 to decide about its proposed state-wide strike on December 11 regarding its demands. “The service rules, which are expected to be drafted by January 15, can be implemented immediately after that,” said spokesperson for the union, as the decision to frame the rules was taken in the meeting held with managing director of the HTC Anand Mohan Sharan recently. He said, “While the HTC has over 1,743 employees manning 43 tourism complexes at present, the corporation is perhaps the only body in the state which has not adopted or implemented the service rules for its staff, though the department is as old as Haryana.” It was converted to a corporation in 1974, but no move had been taken so far to put the things in order regarding the service rules of the employees, he added. He said due to this lacuna, the officials of the corporation had been acting in a discriminatory manner to benefit or victimise the staff. According to general secretary of the union Yudhvir Singh, while some of selected employees were benefited with the 12 per cent EPF contribution, majority were put under the ceiling of contribution of Rs 780 per month. He said while several posts in the department had been lying vacant, majority of the staff was not getting time-bound promotion, though they had completed 20 years of service. There had been no proper and regular recruitment in the corporation for the past several years leading to extreme burden on the staff. Sharan said the service rules would be framed and introduced at the earliest. Regarding the demand of removal of the ceiling on the EPF, he said the department would go by the rules and would accept all the legitimate demands soon. Sikh leaders alleged that the deceased, Gurmej Singh, had crashed into the house of Buta Singh with intention to commit a theft and when the family members got up, he jumped from the third floor to save himself and died. They said, "Why should the police register a case against Buta Singh and other family members when he died due his own fault and bad intentions". Bhupinder Singh Assandh, SGPC member, and Jagdish Singh Jhinda and Didar Singh Nalvi, presidents of rival factions of the HSGPC, joined the protest and accused the police of falsely implicating Buta Singh and his family members in the case. The protesters demanded withdrawal of the case and warned that they would lift the blockade only after the FIR was cancelled. DSP Madan Lal and the SHO tried to persuade the protesters to lift the blockade but the deadlock continued till the filing of the report. The arrested youth, identified as Naveen alias Chuha, was arrested from a spot near Sampla town while he was returning from Delhi. The court remanded Naveen to the police custody till December 3. According to the police, panchayat election-related rivalry had been the reason behind the murder. The police said the conspiracy was hatched at the house of former sarpanch Satbir Singh, who is one of the accused. Satbir and four others have been absconding since the incident. Meanwhile, in another development the police has arrested two persons in connection with the murder of one Krishan, the owner of Fauji Dhaba here on November 7.